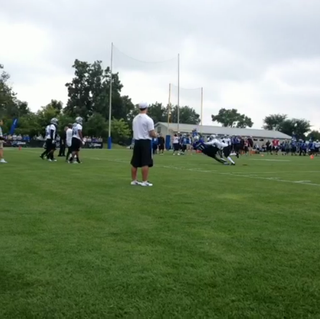 Is This Calvin Johnson Catch Impressive? During one-on-one drills in today's Detroit Lions training camp, Calvin Johnson faced off against cornerback Chris Houston. The play called was a back-shoulder fade, and Megatron made Houston look stupid. Now, is this catch impressive? Absolutely. Houston kept with Johnson off the snap and played him very tight. When Johnson turned back, though, Houston resorted to essentially tackling Johnson as he caught the ball. The fact that Megatron was able to secure that catch while enduring blatant pass interference makes this an outstanding reception. Yes, it's training camp. Shut up. Andy's Counterpoint: This is Calvin Johnson, probably the best pound-for-pound player in the NFL. (Sorry, AP.) He's also one of the most talented players in NFL history, set the record for receiving yards in a season last year, and is nicknamed Megatron because Lions receiver Roy Williams needed the Big Bad of the Transformers universe as a point of reference for how good Johnson is. Look how big the dude's hands are! Calvin Johnson makes spectacular catches as routinely as some people shower; this is just another one. He's set the bar so high for himself that I can't be impressed by a really good catch in training camp. And besides, unlike fellow training camp catch-producer Jermichael Finley, we can be reasonably certain that Johnson's going to top this when he puts on pads.